By the time a vendor calls you to book a valuation, you’re already too late. You’ve either won the instruction, or you haven’t. And there’s nothing you can do about it. You see, when that homeowner calls to arrange a visit, they know which company they will instruct. They will probably follow the traditional route of inviting three agents to value their home, but unbeknownst to these three, they are in order of preference. One is the favourite, the second is the just-in-case, and the third is the also-ran, and probably there just to make up the numbers. It’s unlikely that you’ll know which you are in advance of the market appraisal. So how do you make sure that you’re not just the favourite agent, but the only agent through the door? And is that even possible? You’re not getting through enough doors. Your phone isn’t ringing; your email isn’t pinging. 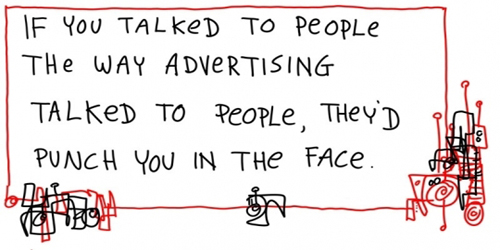 Marketing is getting more and more expensive, and it’s just not working like it used to. In fact, most traditional methods of marketing just don’t work today. One independent agent in Wimbledon I spoke to recently spends £800 a month on Google Adwords. This brings her in, on average, two enquiries a month, so £400 each. But these are not quality market appraisals. Anyone who has to type into Google, estate agents in Wimbledon, is probably not the best quality vendor for you. Of course, they could be out of area, but more likely, they are at best, looking for a third agent valuation to make up the numbers, and at worst, simply looking for a transaction at the lowest cost. Unless you’re a shareholder, don’t bother. There are plenty of better places to spend those extra few hundred pounds a month, for a far better return on your investment. (Do people still do this??) Advertising your properties every week in the local newspaper to prove to vendors that you have plenty of quality stock so that they too will want to list their house with you, even though buyers do not read the paper and book viewings through it, is a very odd way of attracting new vendors. Why not just market to vendors direct?? One of my clients, Alison, from Bedford, commissioned a website from a local web company for £4,000. Within six months, she’d scrapped it, and built her own, for free, on WordPress. It looks better, and does exactly what it needs to do – capture leads from interested vendors and landlords. Another of my clients – Peter from Aberdeen – was using the leading industry CRM software, spending £600 a month on it, as he had a large database. Within a month of working with me, he had cancelled the contract, and switched his email marketing to my recommended supplier, at £12 a month. It’s simpler, easier to use, and has features he needs, that the expensive version did not. Canvassing isn’t dead, but it does need the kiss of life. If you just keep sending out thousands of leaflets to every man, woman and child in your area on a regular basis, then of course you will get some valuations. Throw enough mud at a wall and it will stick. But whilst you’re getting 3 new enquiries from 10,000 leaflets, you’re teaching 9,997 NOT to respond to your marketing. Can you afford to burn out your audience in this way? How much is it costing you right now to have an empty diary? Take your average fee and multiply it by your conversion rate. What figure do you get? That’s how much every new market appraisal is worth to you. Wow. An extra £100k for just 5 new market appraisals a month. Just imagine if you had a marketing system that could generate just over a new MA a week. You too could add an extra hundred thousand pounds to your bank account. 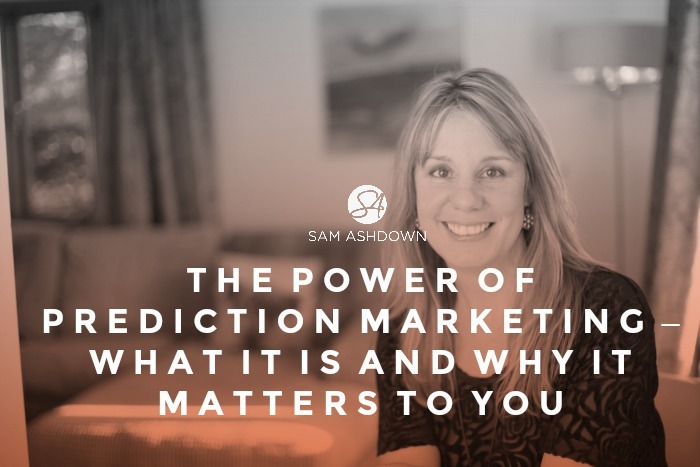 Could Prediction Marketing be the answer? It can get you through the door first – before they even decide to sell, and way before your competitors get a look in. It can make your competitors irrelevant. It can position you as their trusted source of information. 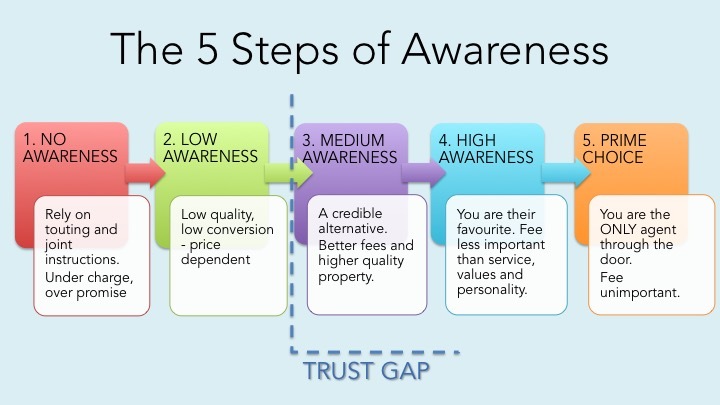 There are 5 phases of awareness, and most agents are stuck in phase two or three. Phase 1 – No awareness in this phase, often inhabited for a prolonged period by new agencies, you have to rely on aggressive touting practices and begging for joint instructions. You have no choice but to under charge, and over promise. Not a very enjoyable place to be. Phase 2 – Low awareness – in phase two, you’re still struggling for brand awareness, and therefore you only get invited out to the low quality instructions, where you’re competing on fee, seduced into over-valuing, and still not converting well. A challenging phase. Phase 3 – Medium awareness – at last, you’re starting to be considered as a credible alternative to the better known agents, finally getting invited out to some nice properties, holding a better level of fee, and starting to convert at over 50%. You’re beginning to see the light at the end of the tunnel. Phase 4 – High awareness – you are their favourite agent. They thought of you first, and you’re often the first one through the door. Your fee is less important to these guys than your service, values and integrity. You’re surprised to notice that even though you’re quoting a higher fee now, you’re converting more often, frequently 66% and higher. You’re seeing the success you hoped for. Phase 5 – Prime choice – it’s happened; you are the ONLY agent through the door. Your fee is almost irrelevant, because it’s you they want. No one else has even been given a look in. Your confidence is high, your fees even higher, and your business is the strongest it’s ever been. Well done. 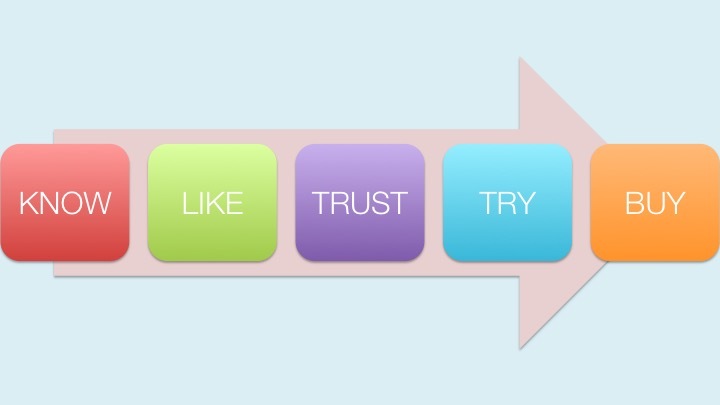 To move to a higher phase, you need to move past the Trust Gap. This is where your clients stop instructing you on valuation and fee, and instead instruct you – your brand, your values and your personality. To get to trust, your clients have to like you first. But how can they like you if they don’t know you? was genuinely grateful for all your help with their property sale; who valued your advice and actually followed it; one whose calls you were happy to take because they were always so enthusiastic about all you were doing for them. Got that person in your mind? Good. 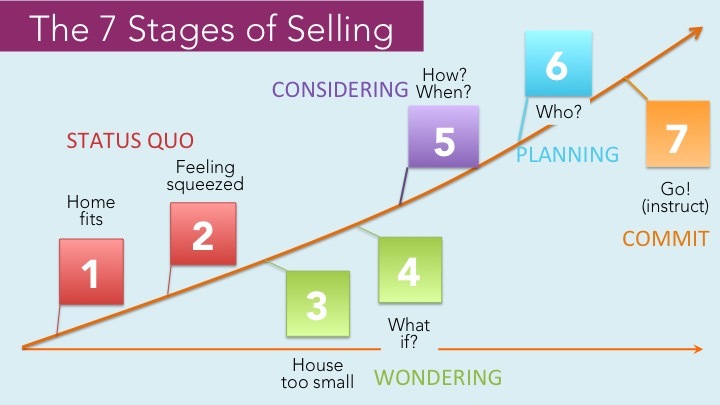 When it comes to someone’s home moving journey, there are Seven Stages of Selling. They’ve just moved into their house, and it fits perfectly. In fact, it’s probably bigger than their last house so feels spacious, and for a while, it’s the perfect home for this time in their lives. Perhaps they moved in as a couple, then baby one comes along. Suddenly, they’ve lost their spare bedroom, there’s a pram in the hallway, and she’s wishing they had a utility room. Their house feels a little disorganised and messy. What they’re Googling: storage ideas, home organisation, Ikea systems. Their home is definitely too small. They are starting to realise that their home no longer fits them, and they may be having arguments over space and messiness. Work-space is a problem, and there’s just nowhere to put things out of sight. Conversations between our couple are now centred on improving their home – maybe they should they try to extend upwards, outwards or in their back garden? What they’re Googling: starting to research the costs and feasibility of home extensions, loft conversions and garden offices. Stage 4 – What if? Now they are discussing the relative merits of staying and improving, versus moving. After all, they may not recoup the costs of a decent extension so could they just move home instead? What they’re Googling: browsing Rightmove and Zoopla, looking at websites and blogs about moving. Driving round appealing areas. Stage 5 – How? When? It’s time to get serious about their move. They’ve decided they’re definitely going to do it, but when is the best time? How much will they upsize by? Where should they move to? All questions that need settling before moving onto the Planning Phase. What they’re Googling: best times to sell, mortgage calculators, specific area information. They are also asking family and friends which agents they have used and posting on Facebook to ask for suggestions. They know when they want to move, how much they want to spend and where they want to move to. Now all they need to decide upon is who is going to sell it? What they’re Googling: agents’ websites, blogs on how to choose an agent, and researching Facebook and other social media pages and profiles. This is where they sign the paperwork, and sit back expectantly, to wait for their home to sell; preferably fast, and for the full asking price. What they’re Googling: moving home checklists, new furniture, removal companies. Look again at those seven stages – would you have considered writing a blogpost on the costs of extending versus moving? Or thought about an article on home organisation? Or even writing a piece on how to use Rightmove and Zoopla? Most agents are writing about content for stage 5 onwards. But this strategy could be missing a golden opportunity – to connect with someone way before they have even considered moving home. When they are only just feeling that their home may not fit them any more. That’s when you can create and build on a relationship that will take you through the stages or Know, Like and Trust before any of your competitors get the chance to. Would you like to pick my brains about your content marketing, and anything else you need to know? I have a handful of free call spots this month so go ahead and tell me a bit about yourself here and if I have a spot left, we’ll get a call booked in.